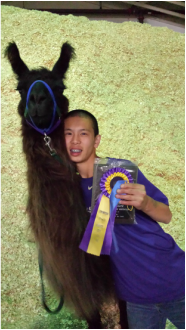 *Flight is trained to drive and is a Pet Partners Therapy Llama Complex Registration with Niki. Niki does performance and an occasional halter class with her too! Left- Western States Futurity Winner! Right- Flight & Camp Korey Camper! How to describe our wonderful girl Flight......The llama with enough angel wings for a whole flock! Flight was a perfect llama from the day she was born. Our close friend Marilynn raised her from one of her favorite females and the day Flight was born Marilynn was in love. From the beginning Flight exhibited the above average intelligence of her sire Isle Eagle. In her first training session she had mastered every obstacle on our farm and was ready to learn higher level ones. As we began showing Flight it became apparent that Flight had M's number and knew Marilynn wouldn't make her do things, so Niki began showing her as she had trained her anyhow. Within a few years Flight was winning nearly every show she was entered in and began training to drive. 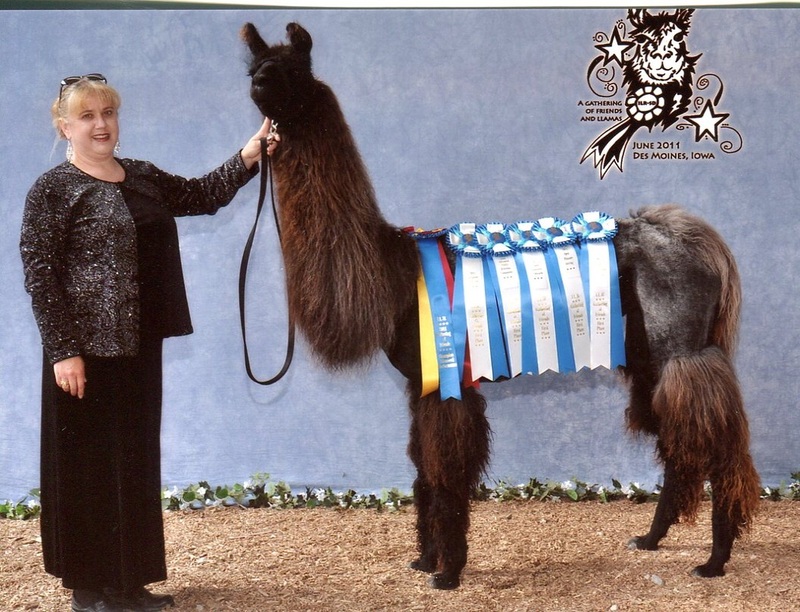 Flight is the closest thing to her sire that exists, making her one of Niki's favorite llamas! In the Fall of 2008 Marilynn was diagnosed with Lou Gehrig's Disease (also known as ALS) and began to struggle with her balance and other things that we all take for granted. Flight made the transition from walking with Marilynn, to walking with her behind her walker and then following her in a motorized chair. As Marilynn ended up in the hospital at one point, we had Flight tested and registered with Delta Society Pet Therapy (now Pet Partners) so she could visit Marilynn if she went in again. One of Marilynn's biggest delights was driving Flight in her llama cart when she could no longer walk. Flight also could be counted on to give Marilynn a big loving kiss whenever it was needed. To say Flight is special and intuitive, is an understatement. Two days before Marilynn passed away, Flight went to her house and calmly sat in front of her wheelchair on the floor. Jim (Marilynn's husband) held Marilynn forward and Flight gave her repeated kisses. It was a magical moment prior to the passing of a wonderful woman. Since then in Marilynn's memory, Flight has gone on to do hundreds of therapy visits at schools, nursing homes, kids camps, weddings and more. She has a kind heart that understands whatever population she visits. Flight has fans all over the country that have seen her work on TV, blogs, magazines and much more! You can follow her (and the other therapy llamas) on Facebook. Anne Beall PhD has written a book on the human and animal bond and featured Flight in one of her chapters. It is called Heartfelt Connections and is available on Amazon.